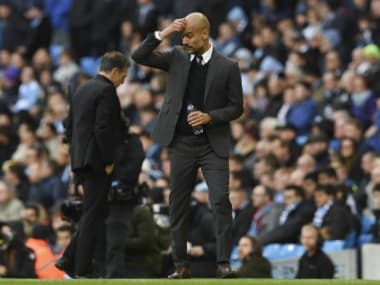 Manchester: Pep Guardiola kept his Manchester City players in the dressing room for nearly an hour after a 1-1 draw with Southampton meant the club had now gone five games without a victory despite the result taking them back to the top of the Premier League. 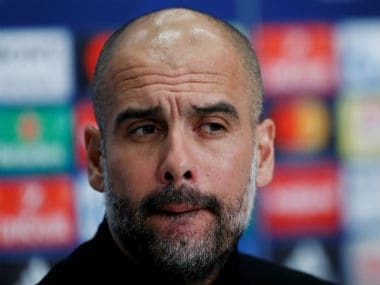 The City manager insisted that he was not venting his anger on a squad that started his first season in charge at Eastlands with 10 consecutive victories. But he was clearly frustrated by a loss of form that has seen them beaten at Tottenham Hotspur and held at home by Everton and, now, Southampton, in their last three league outings. "The red wine was good and I took a little bit longer with my glass," joked Guardiola, who has also seen his team draw at Celtic and be beaten 4-0 away to former club Barcelona during their current run, as he spoke to reporters following Sunday's stalemate. Substitute Kelechi Iheanacho at least salvaged a point for City and cancelled out a first-half opening goal from Nathan Redmond. "I was a football player, I know this can happen," said Guardiola when he finally emerged from the City dressing room. "In football, I have known for a long time, you are able to win 10 times in a row then you’re not able to win for five times. "We have to accept that when that happens, accept you have to return to what you were doing before. But I’m not a guy to get angry. I have to discover the reason why this has happened." Guardiola’s mood cannot have been helped by the fact that a bad error by England defender John Stones -- one similar to that made by goalkeeper Claudio Bravo in the midweek loss to Barcelona -- gifted Southampton their goal, although the Spaniard insisted he had no problem with such mistakes. 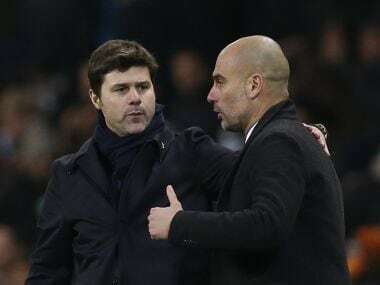 "People can talk about an own goal at Tottenham, Claudio in Barcelona or two missed penalties against Everton but it’s not about that," said Guardiola. "It is easy for a manager to say that excuse but it is because of something more, about the team, about how you react in these situations. "Right now, in this moment, we’re just not in that rhythm we had before. But the big difference between us in the first half and second half was obvious. "The first half was a problem, the second half the players changed their mentality and were unfortunate they couldn't win." "Five games without winning is because something happened but we need to start from a bit below where we were and go up and up." 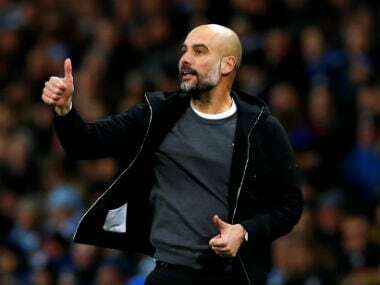 Guardiola can start that improvement in the League Cup local derby visit to Manchester United on Wednesday although it seems likely both he and opposite number Jose Mourinho will rest key players. "We will see tomorrow (Monday), after the players’ recovery, then decide if it's necessary to make rotations or not,” said Guardiola of his team selection. "It’s important to change our dynamic from the previous games. Everything influences you. If you can play well or badly, it affects your mentality, so we are working on it." Meanwhile Southampton manager Claude Puel was delighted by the resilience his side showed following their narrow Europa League loss away to Inter Milan on Thursday. "I'm happy of course for the point and also with the spirit," he said. It was a significant game against a good team."